…in which I rant about poor word choices and ignorant teachers. Arghhh! The ignorance! The dumbassiness! It hurts! In a recent post (which I first read about in Mercedes Schneider’s blog entry, Teacher Workload vs. Teacher Salary: And the Winner Is…) blogger Paul Murphy wrote that teachers complain about their workload and low pay because it makes them feel superior. Teachers who talk about working 12-hour days and going in on weekends and spending thousands of their own dollars aren’t actually complaining about it. They’re proud of it. They believe it’s proof of their dedication. It makes them feel superior to those who aren’t as selfless. I was a teacher for nearly four decades…and I talked about how much work it was to be a teacher, but it wasn’t bragging. Most of the time I was trying to explain to people who have no clue what teaching actually entails, that it’s a real job. It takes a lot of work to do it well. I never felt “pride” that I was working for free or paying for classroom supplies with my own money. On the contrary, I often felt it was shameful that our nation’s children were such a low priority that the workers felt obligated to subsidize the employers. Teachers spend extra money and time on our classrooms because we put our students first. Pride? Not really. Necessity? You bet. Murphy even admits that he wouldn’t stop doing those extra things…and he goes on in a subsequent post to explain further. 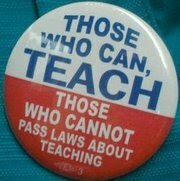 Teachers need to organize, work the contract and by doing so, let their employers know that they won’t work for nothing. This, he admits, is easier said than done. I agree. My disagreement with Murphy is in his language choices. Teachers don’t talk about their jobs to “feel superior.” We’re not “proud” of our sacrifices. We do them because we care about our students. Murphy was speaking specifically of elementary teachers (although I know secondary teachers who go in early and stay late, as well). We go in early and we donate work. Why? Because the work has to get done, and if we only work the hours for which we’re paid our students will be the poorer for it. And, I should add, it’s not all decorating, something Murphy, as an elementary teacher, ought to know. 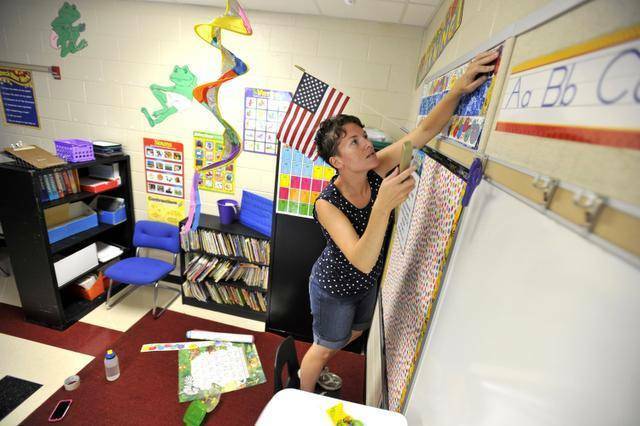 Decorating a classroom is not like putting up Christmas lights, Thanksgiving turkeys, or Valentine’s Day hearts, although that might be part of it. We also display motivational posters, calendars, word walls, charts, maps. Those are better labeled teaching tools not decorations. We use those teaching tools for the benefit of the students. So, when I went in to school a week early to get things ready, aside from making sure that materials were ready for students, and making sure that the classroom looked inviting, I also made sure that there were necessary teaching tools available for use during classroom instruction. …what struck me, as it always does, is the contradiction between whining about low pay and bragging about working for free. Again, not bragging! And not whining about low pay, either. Are school boards accused of whining about money when they claim, “we haven’t got enough money for a 1% across the board raise”? Are legislators accused of whining when they say, “this is all we can afford to budget for public education this year”? Our so-called “whining” about pay is really an objection to the lack of full funding from the state. Local school systems are forced to choose between providing a full curriculum with sufficient materials, or a well paid staff. They often cannot do both. But, again, the common knowledge is that teachers don’t really work that hard, so why pay them like other professionals? Teaching is easy. After all, they have all that time off in the summer, get to go home at 3 pm every day, and only have to spend their days with a bunch of kids. How hard can it be? That “common knowledge” is the reason teachers need to talk about how much work they do, how much they spend on their classrooms, and how little they’re paid in relation to how much they do and how much other professionals with equal training are paid. My objections (whining?) are with Murphy’s word choices…I agree with much of what he wrote, but bragging, decorating, and whining, are not only incorrect descriptions of what teachers do, they’re (IMHO) demeaning. Words matter. Those elementary teachers sure are precious, aren’t they? They ought to spend some time trying to grade labs or essays only during the time that they’re at school. Working overtime as a high school teacher *is* doing the minimum. Sheesh. Yes, it’s true. The comment about how easy teachers have it (in this case, elementary teachers) was written by…a teacher. Socrates is apparently a high school teacher who thinks that elementary teachers have it easy because we don’t have to grade labs or essays and we don’t have to work extra hours. We are, apparently, “precious” because we have it so easy, and if we really want to work hard we would have become secondary teachers! Socrates is obviously ignorant about what goes on in an elementary classroom. Now it wouldn’t be hard to find an elementary teacher who is equally ignorant about secondary teachers – Someone who might say, “they get to go home early every day”…”they don’t have to worry about recess duty, bus duty, or cafeteria duty”…”they get a whole period for prep time (or lunch)”…”they may have two or three preps a day, but elementary teachers have seven, eight, or even nine different subjects they have to teach every day”…and so on. Luckily for both sets of ignoramuses, I know differently. I know from experience how hard elementary teachers work. I know from observation how hard secondary teachers work. There are differences between elementary and secondary teachers, which we won’t get into right now. Suffice it to say, however, that those secondary teachers, like Socrates, who think that elementary teachers don’t work just as hard as they do, are wrong…wrong…wrong. It’s teachers like Socrates who perpetuate the stereotype of “teaching as an easy job,” and Murphy, who use demeaning language, perpetuating the myth that teachers complain without justification, who make life hard for the rest of us. 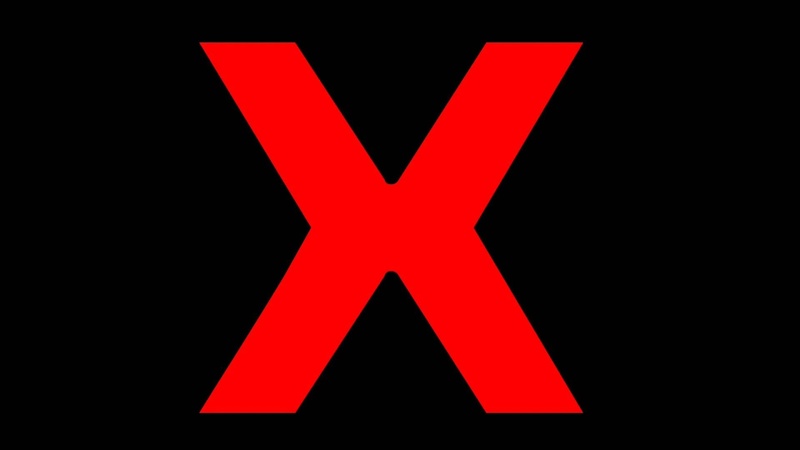 Comments Off on …in which I rant about poor word choices and ignorant teachers. The “Year’s Bests” and “Year’s Mosts” list…images, blog posts, quotes, podcasts, and books. In which Steven Singer teaches us how well our public schools are doing. Facts matter. …America’s public schools are NOT failing. They are among the best in the world. Really! I follow Steven Singer’s post with one of my own about the amazing success of America’s public schools. When she looks at the U.S. international test scores, Secretary DeVos, and other policy makers see “failing schools.” This is wrong. The low average scores, and the even lower scores aggregated for low income students, indicate that economic inequity is overwhelming the infrastructure of our public school systems. Instead of blaming public schools, politicians and policy makers must take responsibility for ending the shameful rate of child poverty and inequity in America. This post about how Indiana and Wisconsin are destroying the teaching profession, received the most attention of anything I wrote this year, picking up several thousand hits. …because nothing says increased achievement more than hiring under qualified personnel. With a “market-based” education economy comes advertising. Jennifer Berkshire, Jack Schneider, and their guest, Sarah Butler Jessen, discuss “edvertising”. If you are at all concerned about the privatization of public education you owe it to yourself to listen to this. …in schooling certainly there is a private good aspect to it. But schooling is also a public good. It’s something that benefits our society, our neighborhoods, our communities. It benefits the most advantaged, but it also benefits the least advantaged at least theoretically. So when we acting as consumers, we’re only acting in alignment with the private good aspect of education. So think for instance, buying an alarm for your house versus trying to cultivate safer cities or safer neighborhoods. Whereas one of those is an inherently private good. The alarm is only going to protect me and my family. The public good is going to benefit everyone in the community and that’s not something I can promote via shopping. My favorite quotes from the year…from actual, real-life educators. One of the great contradictions within corporate ed reform is the promoting of a “parental choice” that stops short of the parent’s choice to opt his or her children out of federal- and state-mandated standardized testing. We need to learn from history. Lesson 10: Believe in Truth: To abandon facts is to abandon freedom. If nothing is true, then no one can criticize power, because there is no basis upon which to do so. If nothing is true, then all is spectacle. The biggest wallet pays for the most blinding lights. 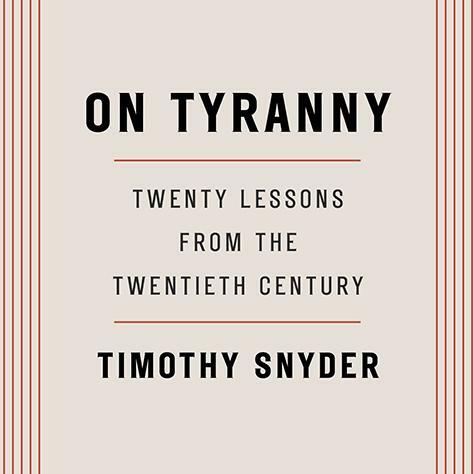 Here’s a video of Timothy Snyder talking about his book, HERE. 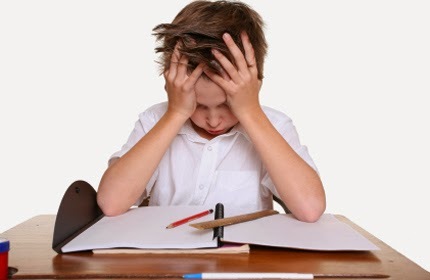 Why are so many kids struggling with reading? The vast majority of students’ reading difficulties are due to lack of opportunities…before they even get to school. Students who grow up in poverty deal with out-of-school factors which contribute to lowered achievement. David C. Berliner lists seven such factors which get in the way of achievement. (7) extended learning opportunities, such as preschool, after school, and summer school programs that can help to mitigate some of the harm caused by the first six factors. Until we can successfully eliminate or reduce the shameful rate of childhood poverty in the United States we’ll continue to have an economic/racial achievement gap. 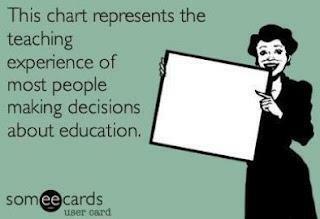 No amount of charter schools, testing, school closings, vouchers, or other ed “reform” will change that. Carol Burris, the Executive Director of the Network for Public Education has researched the ed-reform debacle in Indiana. This is the first of a three part series. Daniels, who was governor from 2005 to 2013, would earn national recognition for his methodical and persistent undermining of public schools and their teachers in the name of reform. Pence would follow Daniels as governor, pushing privatization even further. Pence would award even more tax dollars to charter schools and make Indiana’s voucher program one the largest in the country. Klipsch would start and run a political action committee, Hoosiers for Economic Growth (a.k.a. Hoosiers for Quality Education), that would play a major role in creating a Republican majority in the Indiana House to redistrict the state to assure future Republican control. Between 2001 and 2007, 36 percent of American school districts decreased focus on social studies and civics, according to a study by George Washington University’s Center on Education Policy. By 2006, just 27 percent of 12th graders were proficient in civics and government, said the National Center for Education Statistics. The American Civil Liberties Union has issued a report about the charter industry in Arizona. They discovered that [surprise!] charter schools have found ways to avoid the accountability forced upon public schools. This is worth examining carefully. Some of these exclusionary policies violate state and/or federal laws. The fact that so many Arizona charter schools’ enrollment policies and procedures contain plain legal violations demonstrates a clear failure of accountability. The Arizona State Board for Charter Schools authorizes and governs the vast majority of charter schools. The agency is responsible for ensuring that charter schools follow all laws and abide by the terms of their charter contracts. It is concerning that they have missed these violations of the law, most of which are publicly posted on schools’ websites or written into other widely available documents like student handbooks. Though similar issues may be occurring within district schools, the ACLU of Arizona chose to focus its research on charter schools after hearing from several parents whose children were denied enrollment or faced barriers to enrollment at charter schools across Arizona. The administration has also appointed cabinet members who want to destroy the department they are in charge of, or have absolutely no idea (“oops”) what their department does. 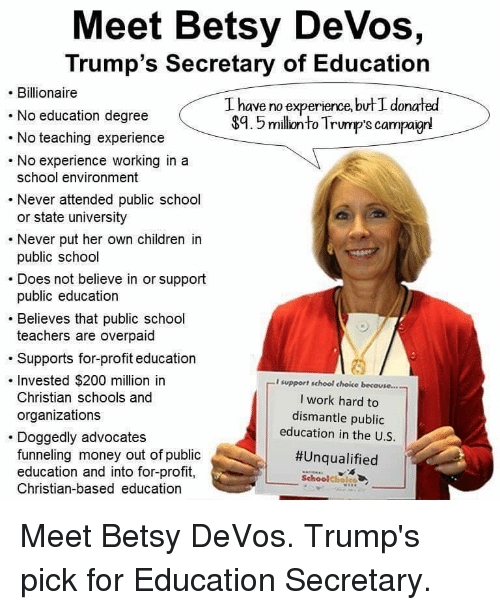 This is a good time to remind everyone that the current Secretary of Education, Betsy DeVos, is just as unqualified as the nominee for judge in the previous clip. She has no education background. She has no experience in public education, either as a student, parent, or teacher. She knows absolutely nothing about what goes on in a public school. DeVos is just the latest, and most egregiously unqualified Secretary of Education in a long line of unqualified Secretaries of Education. “So you have no experience with college financial aid or management of higher education,” Warren said. “Federal law must be followed when federal dollars are in play,” DeVos said. “So were you unaware when I just asked you about the (Individuals with Disabilities Education Act) that it was a federal law?” Hassan asked. Betsy DeVos and any corporate reformer who impacts school policy should be required to spend at least a month each year teaching in a public school classroom. DeVos just attended Gov. Jeb Bush’s ExcelinEd meeting in Nashville. Let Jeb Bush and his corporate friends and politicians who drive corporate reform also teach for a month. None of these individuals understand the problems they have created in the classroom. If they taught a class for a month they would see firsthand what they have done. How good are the public schools in your community? If you’re a parent/guardian of a school child, or a teacher in the local schools, chances are you think your schools are pretty good. If you don’t work in a local school, or don’t have children who attend local schools, how do you judge the quality of your local schools? Should you rely on news media reports? 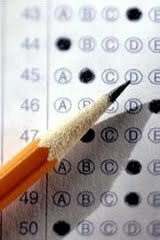 How about state test scores, or state A-F grades? 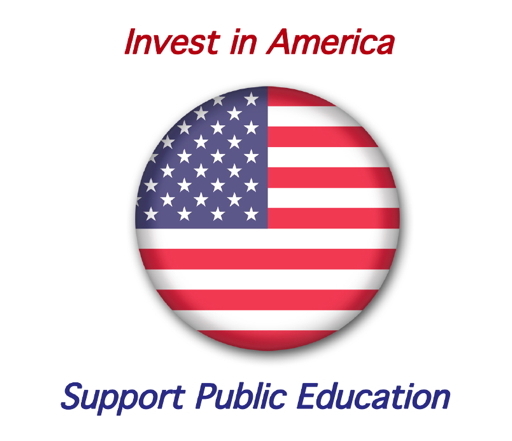 In the annual PDK Poll of the Public’s Attitudes Towards Public Schools, published last September, seventy-one percent, almost three-fourths of public school children’s parents/guardians, gave their local schools a grade of A or B. Parents of children who attend public schools are among the people who know the schools the best. Local parents know that their children are more than test scores. They know the teachers, administrators, and staff. Their neighbors work in the cafeteria or on the custodial staff. They appreciate the hard work of school employees. Why, then, do they ignore the same concepts when it comes to the quality of schools nationally? Only 24% give the nation’s schools a grade of A or B. 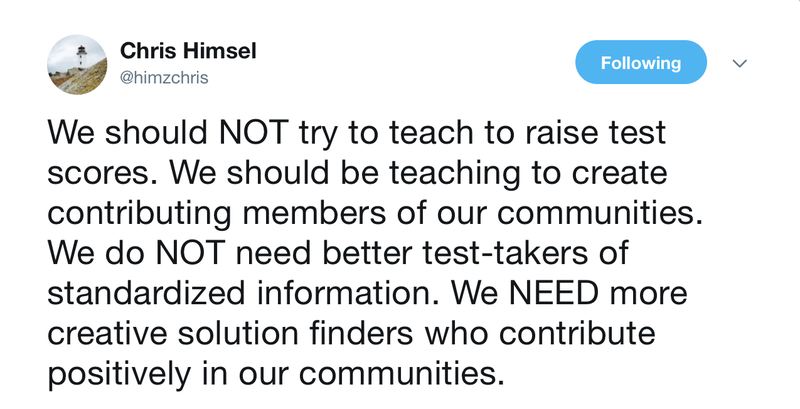 Those same parents who understand that the news media, or test-based school grades don’t tell the whole story when it comes to their local community’s school, believe the opposite when it comes to schools nationally. Earlier this month, another survey was published. In this survey it was educators who were asked about the quality of public schools. The results were reported in Education Week’s Educator Political Perceptions: A National Survey. And, surprise! The educators responses were nearly identical to those of parents and guardians of public school students. American educators gave their local schools, the ones they worked in and knew the best, high grades, but nationally, not so much. Seventy-two percent gave their own school systems an A or B. 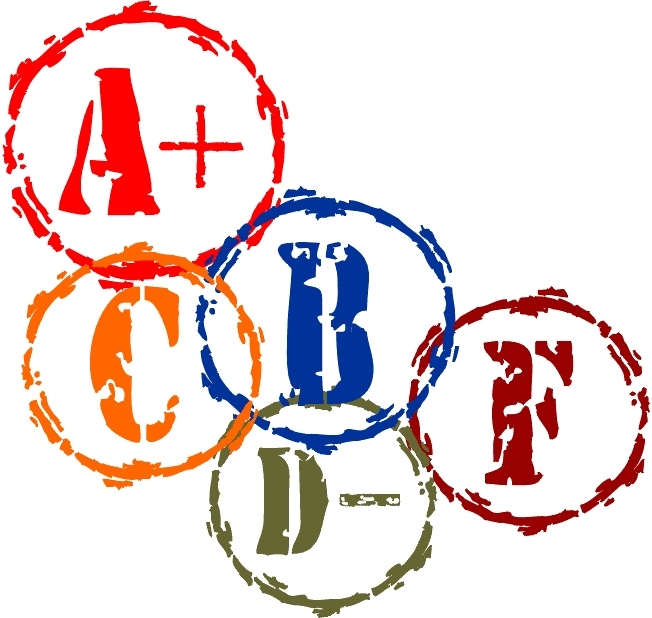 Only 35% graded the nation’s schools as an A or B. Across the board, educators give the public schools in their district better grades than those in the nation as a whole. While 25 percent assign A’s to public schools in their districts, just 3 percent allot that grade to schools in the nation as whole. Clinton and Trump voters assign similar grades both to their own schools and the nation’s schools. Compared to teachers and school-based leaders, district leaders are slightly easier graders of both their districts’ schools and schools in the nation as whole. For example, 34 percent of district leaders assign their districts’ schools an A as compared to 24 percent of teachers and school-based leaders. In other words, the folks who have the closest contact with schools, either as parents or professionals, grade their local schools high, but their opinions about schools nationally are much lower. Mathematically, of course, this doesn’t make sense. How can the majority of parents and educators “know” that the nation’s schools are poor, when that same majority “knows” that their local schools are excellent? Where are all the “failing” schools if not in local communities nationwide? Where are all the “excellent” schools, if not in other people’s local communities as well as ours? Those people whose children attend public schools and those who work in local public schools know more about how the schools are run. They see the work that goes into them. They are the stakeholders. They realize that schools are not perfect – no human institution is – but they understand that schools are more than the sum of their parts. But, thanks to politicians, pundits, and policy makers, that understanding doesn’t seem to extend to the public schools of the nation, as a whole. My own local schools, for example, are excellent. I know this is true because my children and grandchildren have attended them…and I have worked in them. I know the teachers, administrators, families, and children. I know that the teachers who work there spend more than just their contracted working hours in order to make the schools responsive to the needs of the children who attend them. But you might live on the other side of the county (or state, or country)…and you might see that my local schools are not perfect. 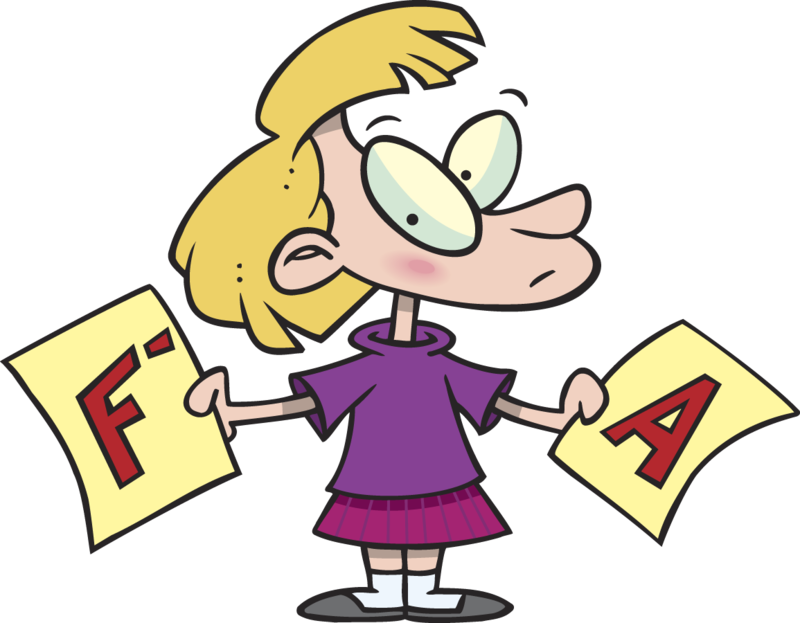 Sure, this school in the district received a grade of A from the state, and that one got a B, but there’s one on the other side of the district which got an F…and one with a D [and you might also notice that the school grades correspond to the neighborhood economic status!]. There are students who struggle, teachers and administrators who fail in their responsibilities, and administrators who have been out of the classroom too long. You might see my local schools’ A-F grades and conclude that, at least some of them, are failures. If these were your local schools, what criteria would you use to determine their quality? Would you listen to the parents and teachers who know what goes on in the school? Or would you rely on the test scores and state A-F grades? How do we really know how the nation’s schools are performing? Are student test scores the most reliable criterion upon which to judge a school? The United States seems to be going out of its way to damage public education and discourage public school teachers. We ignore the voices of educators and ignore current educational research (much of which is done in the U.S.) used by high achieving nations. Instead we listen to edupreneurs interested in profit, politicians looking for kickbacks, and policy makers who don’t know anything about teaching, public schools, or public education. We create “failing schools” by defining success using narrow, standardized test-based results and force teachers to teach in ways they know are developmentally or academically inappropriate. In addition we ignore out of school factors that lead to lowered student standardized test-based achievement. Finally, we create educational models which discourage young people from choosing education as a career and push out current career teachers. We use “failing schools” as an excuse to blame teachers, bust unions, and privatize. 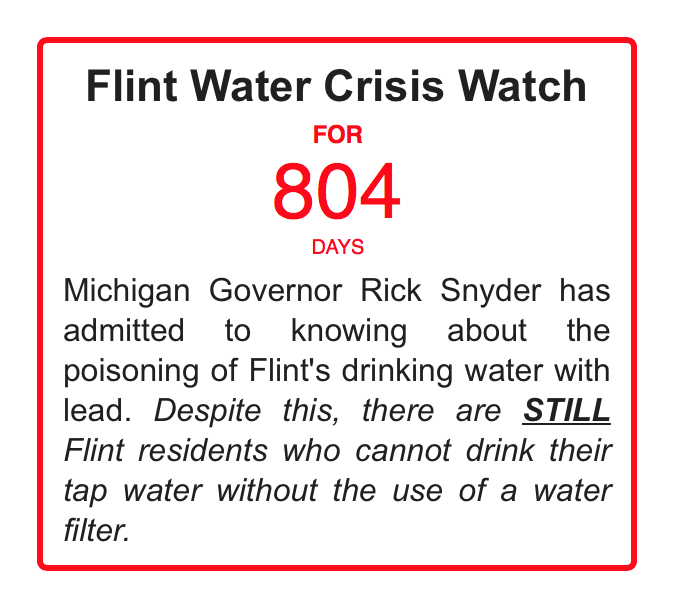 Meanwhile, the needs of our most vulnerable students are being neglected. From Carl Sagan in 1989. …we have permitted the amount of poverty in children to increase. Before the end of this century more than half the kids in America may be below the poverty line. …despite knowing what a spectacular teacher looks like, the educational models we have in place actively discourage every one of these. This is a long quote, but well worth it…and click the link above to read the whole article. I am beyond tired—beyond exhausted, really—of persons who have never taught anyone anything lecturing the rest of us who have about what we are doing wrong, how stupid we are, how lazy we are, and how they know better than we do when it comes to everything about teaching and learning. How about this, Eva and Elizabeth?–instead of pontificating about things you are equally arrogant and ignorant of, why don’t you each go back to school, get an education degree, or two, or three, get certified, do an internship (for free–in fact, pay a bunch of money to do so), or two, or three, then see if you can find a job in a school. Then, teach.I don’t care what you teach; what grade level; what subject. But stick it out for at least a school year. Write your lesson plans. Grade your papers and projects. Go to all of those grade level meetings, and IEP meetings, and school board meetings, and budget negotiation meetings, and union meetings, and curriculum revision meetings, and curriculum re-revision meetings, and teacher evaluation meetings, and “special area” meetings, and state department of education meetings, and professional development in-services, and parent-teacher conferences, and open houses, and attend all those concerts, and football games, and dance recitals, and basketball games, and soccer matches, and lacrosse games, and honor band concerts, and school musicals, and tennis matches, and plays, and debates, and quiz bowl competitions, and marching band shows, and cheerleading competitions, and swim meets. The Indiana State Board of Education ignored the input of dozens of teachers and administrators. They didn’t ignore the input from the Chamber of Commerce and the Indiana Manufacturers Association by a vote of 7-4. All four of the “no” votes came from experienced educators. 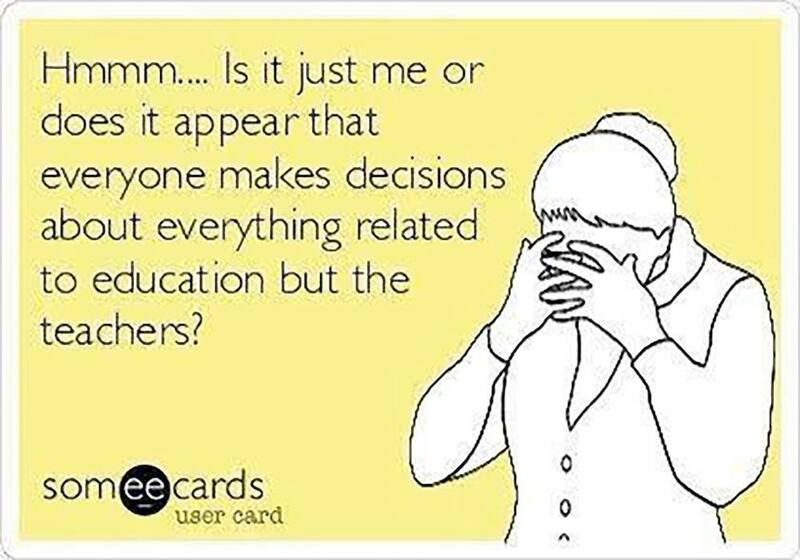 Who do you think knows more about public education, educators or business people? Teachers, principals and superintendents from across Indiana told the state school board during six hours of public testimony Wednesday that the rush to adopt graduation pathways before finalizing how they’ll work inevitably will result in another Indiana education fiasco, akin to extra-long standardized testing and the repeatedly revised school accountability grades. WHY DON’T WE USE OUR OWN RESEARCH? This run-on quote by Finnish educator Past Sahlberg asks why high performing nations are using the newest research on education, much of it coming out of the United States…but we, in the U.S. are ignoring it and continuing our test and punish ways? …why people are not really taking their own research seriously? How can it be that in the United States, day in and day out, people come across great books and research reports and others and they say, no, this is not how it goes, but when you cross the border, just north of the US, go to Canada, and you see how differently policy makers, politicians, and everybody takes the global international research nowadays, and they consider their findings and look at the findings of the research compared to their own practice and policies and their finding inconsistencies there just like in Finland, they are willing and able to change the course. But not in the US. Would you work at a place where the budget was so tight that you were allotted one roll of toilet paper a year? Could you run your classroom on one roll of toilet paper per school year? How can a “civilized” society treat any of its citizens in this manner? How can we treat our children like this? “There can be no keener revelation of a society’s soul than the way in which it treats its children.” – Nelson Mandela. From Katherine Brezler, a second-grade teacher in The Bronx and a candidate for New York State Senate in the 37th District. While billionaires get a handout, my students — and students across the country — get one roll of toilet paper. Every year that I’ve been a teacher, that roll is gone well before the year is over. Simple hygienic necessities should not be subject to budget constraints. Our teachers and students deserve dignity and respect. I’ve been saving this quote. It contains material which has been difficult for me to confront. The Looking Back article, from the blog, Reading While White, deals with the children’s book, Charlie and the Chocolate Factory, its racist content, and the racism of its author, Roald Dahl. There is no denying that Roald Dahl was a racist and anti-semite and those prejudices leaked into his work. [See here, here, and here.] I accept that. I accept the fact that Dahl and his agents attempted to purge the book of its more blatant expressions of racism by rewriting the Oompa Loompas as non-black and non-African pygmies in the second and later editions, as well as the movies based on the book. I also accept that those rewrites did not completely remove all offensive elements from the book. The quote below deals with how to come to terms with a beloved book, and I do love this book, which is so obviously flawed. The author wonders if her love of the book was not based on the actual book, but on the circumstances of her exposure: a favorite teacher and a highly motivating environment and study of the book. What if, she asks, we had read Charlie and the Chocolate Factory critically? …every time that critical voice or bubble of discomfort arose, I chose not to pay attention to it. It was selective memory, because I did not want to let this book go. I have to call that what it really is: White fragility (and other kinds of fragility, considering the myriad ways this book is problematic). I can’t help but wonder now if my love for this book wasn’t caused by Dahl’s craft at all, but by the joy of remembering reading the book all by myself, or the kickass teacher who made her class immersive and fun (let’s not forget the bathtub). Still, it’s worth noting that criticisms of this book are not new. As long as there have been children’s books, there have been people working against racism in children’s books. My teacher was awesome in a lot of ways, but she did put time and effort into a celebration of THAT title. What if we had read something else? 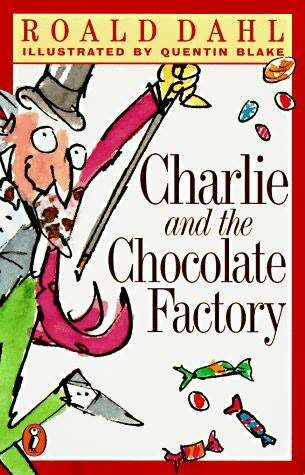 Or what if we had read Charlie and the Chocolate Factory critically? The United States Bill of Rights, the first ten amendments to the U.S. Constitution, was ratified on this date, December 15, in 1791. The First Amendment within the Bill of Rights guarantees freedom of speech, religion, a free press, assembly, and petition. Today, many Americans are unfamiliar with the details of the First Amendment. The recent Annenberg Center civics survey revealed that American’s knowledge of the First Amendment is sorely lacking. 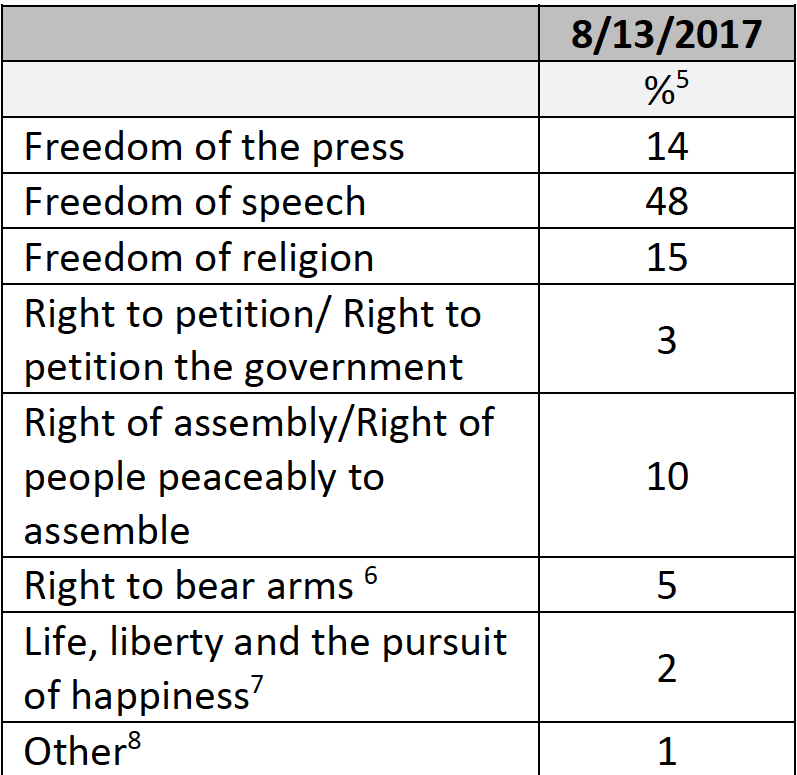 The chart below shows the number associated with each First Amendment guaranteed Freedom, as well as the percent of people who included things which are not included in the First Amendment (6, 7, and 8). A full 37% of Americans surveyed could not name even one freedom guaranteed by the First Amendment. The apparent ignorance of Americans about their own government is disheartening. As a child, I listened to my grandfather tell stories about growing up in Dvinsk, Russia (now Daugavpils, Latvia). One story which stands out in my memory was about his hiding in their home during one of the frequent pogroms against the Jewish communities. He emerged when it was over only to be told that his grandfather had been killed by the Tzar’s cossacks. 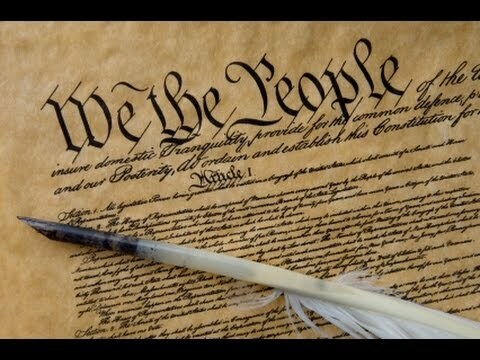 That story has given me a strong feeling of gratitude to the American Founders for the First Amendment. Because of its scope, the First Amendment is, to me, the full expression of the intent of America. It acknowledges the freedom of thought which is, as Jefferson (or possibly another member of the Committee of the Five) put it, the unalienable right of every citizen. 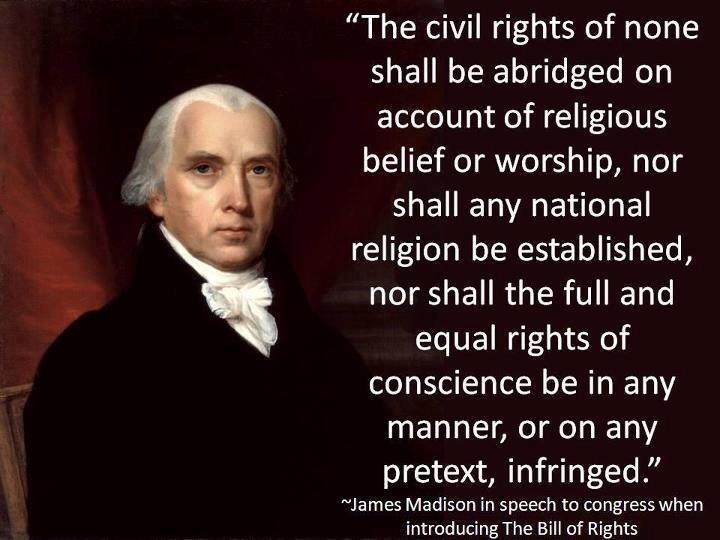 The guarantee of religious freedom is that part of the first amendment which comes to mind when I think about my grandfather’s story, and for that we have Jefferson (The Virginia Statute for Religious Freedom) and Madison (Memorial and Remonstrance Against Religious Assessments) to thank. The Virginia Statute was the first time an English speaking country or colony, in this case, the Colony of Virginia, DE-ESTABLISHED the state-sponsored church and gave full religious freedom to people of both all religious faiths and no religious faith. Because of Jefferson’s leadership in this context, when my grandfather became a citizen in the early part of the 20th century, he was not taxed to pay for a state-sponsored religion, and he was given the same rights of citizenship as everyone else. …freedom makes a huge requirement of every human being. 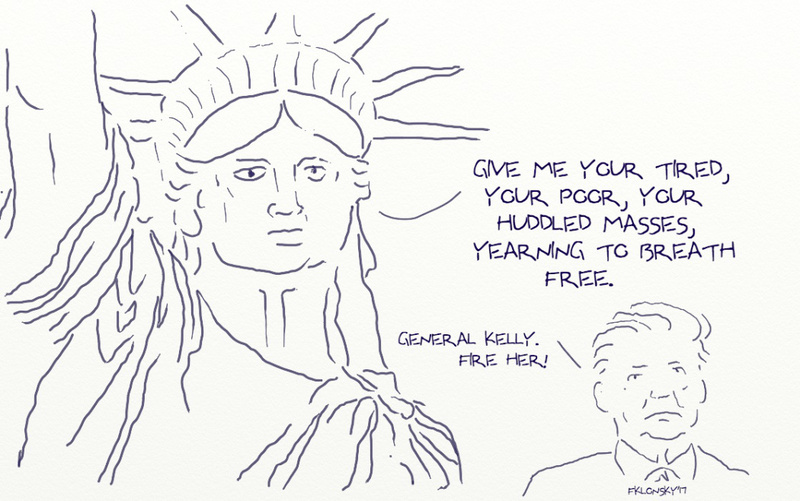 With freedom comes responsibility. The First Amendment provides Americans with great freedom…which we tend to take for granted. We have the freedom to misunderstand, ignore, or be ignorant of, the responsibilities of citizenship. 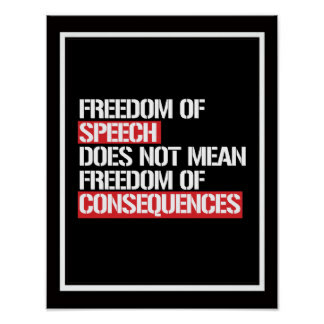 Freedom of Speech is one area where many people do not seem to understand the relationship between freedom and responsibility. Simply put, Americans’ right to self-expression is extensive, but there are limits. You can say what you want, unless you’re putting others in danger (e.g. shouting “fire” in a crowded theater), or lying about someone or group of someones (e.g. libel laws). For a comprehensive discussion of limits to free speech, see United States free speech exceptions. Finally, within the limits discussed above, we can say what we want, but with that freedom-with-responsibility comes consequences. This concept is difficult for some Americans to understand. If you call your boss a vulgar name, you won’t be arrested for your speech, but chances are you will be looking for another job. 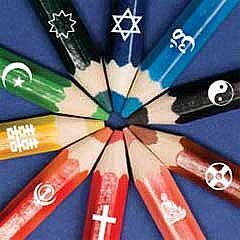 If you make a controversial statement, you will likely be criticized. Criticism of your speech is not an abridgment of your right to say it. Criticism of a political candidate’s speech is not an abridgment of his or her right to say things. When a controversial speaker is denied a platform by a University or civic group, the speaker’s Freedom of Speech is not abridged. The speaker is free to speak to other groups, or write and publish his ideas. There are way too many Americans who believe that criticism of someone’s opinions is akin to restricting their freedom of speech. It’s just not so. Understanding how our government works should be an essential part of the education of American citizens. 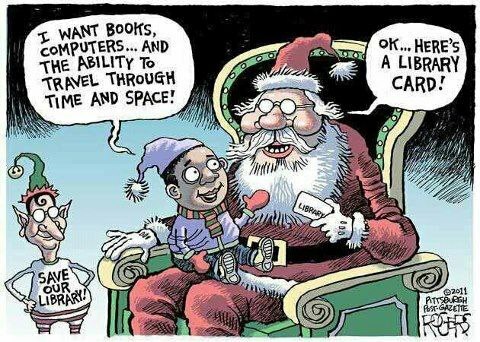 Unfortunately, the obsession with standardized tests in U.S. schools has pushed out content areas including Social Studies and Civics. It’s time to change that. In order to maintain our freedom it’s the responsibility of every citizen to understand the basis of, and the processes involved, in running our nation. It’s our responsibility as a society to give every citizen the opportunity to learn how the government works, our rights under the law, and our responsibilities as citizens. When we neglect the Civics Education of our children, we fail in our duty to raise up the next generation of citizens. We require immigrants to learn basic Civics in order to attain citizenship. We ought to require the same for our children. How’s your civics knowledge? Take the U.S. Citizenship and Immigration Services Civics Practice Test.